Improving the quality of life for seniors is important. Sometimes, the simplest of inventions are invaluable for allowing these citizens to continue life as normal. Items like food table trays, overchair tables and over the bed tables have been around for a long time. The reason for their popularity is that they actually have the ability to help. It can be difficult for seniors and elderly people to get access to their food. Often times, it is impossible for them to get to an actual table for their meals. When this is the case, the use of food trays becomes essential. If you’re wondering if you or a loved one could benefit from these items, you’ve come to the right place. Reading is another task that becomes difficult as we age. Seniors often have difficulty holding things for long periods of time. To mitigate such problems, you may wish to consider using a rolling reading table. These items come in many different shapes and sizes. Whether you want a table for use on couches, lift chairs or handicap beds, there is a model available for each. Some of these rolling tables are actually so compatible that they can be used in just about any situation. Making life simpler is essential for our seniors. They often need a little bit of help doing everyday tasks. Both food table trays and overchair tables can help immensely. If you’re loved one has become limited mobility wise, these items can help them regain some freedom. They make great gifts as well. Even a rolling reading table can help simplify ease of use issues. While our elderly family members may find certain tasks more difficult, there are things we can do to help. Buying simple tools will allow them to do the things they love, and want to do. Have the option of eating where ever you want with food table trays. When you are comfortably lying on a bed or sitting on a couch or seat, these adjustable lunch trays can easily be placed in front of you to your desired height. Best of all, you can bring the food table trays closer to your body to prevent food crumbs dropping or drinks spilling onto your sitting area. Rolling Over The Bed Tables – This is the perfect food tray table for eating in bed. It is easily adjustable for many different heights and is sturdy enough to support heavier objects. This is the rolling adjustable height bed tray to get for all your needs. 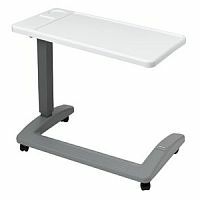 Adjustable Rolling Tray Tables – This affordable table can be raised and lower anywhere from 28 to 45 inches. If cost is a concern, then you should consider this table. Book and Laptop Stand Rolling Tables – This handicap laptop stand has wheels for rolling and also a wide extra table for your mouse or book. If you use your laptop a lot, this might be the table for you. You may want to consider buying one of these items as a present, or just a nice thing to do. Making sure your loved ones are not in need is essential for everybody to live comfortably. Consider reading tables and food trays for your elderly peers as a great gift idea.